The poll, conducted by Hill.TV and the HarrisX polling company, found that 11.5 percent of voters said they had already voted in the elections, while 12.2 percent of respondents said they plan to vote in person before Election Day. Another 48.7 percent of respondents said they planned to vote in person on Election Day, and 17.9 percent of voters said they planned to vote by mail or absentee ballot. Ten percent of respondents said they did not plan to vote at all. Even though 90% is probably outrageously optimistic, any increase in voter turnout would be a great thing. A consistently healthy voter turnout in all future elections is necessary for any hope of building a healthy country (something we do not have now). A personal peeve of mine is that the ones who don't vote are the ones who complain loudest about how dysfunctional voting in elections is! And in the real world, it looks like voter turnout will end up (after absentee and provisional ballots are counted) to be around 49%. In the US this is seen as an "outstanding" voter turnout for midterms, but again in reality is utterly abysmal and shows how much further we have to go. We are left to wonder what that turnout would look like without voter caging, closed polling places and Jim Crow style obstacles to voting, but those are all issues that can only be fixed after people take notice and become informed. Thankfully, the turnout was enough to help the US avoid disaster last Tuesday. Felon voting rights passed by referendum in Florida. And by felon, that's not violent felons, but more like people who got caught with a bit of weed more than once. But we still need to do so much better. I hope many of the newly registered voters continue to be engaged through 2020 and beyond. And I'm heartened by the organization I saw across the board. @Peter O'Connor: I agree! One problem is, people like this seem so sophisticated at first. And it's true, in a way, voting only does so much. But that is because, in a healthy democracy/republic, voting is the absolute minimum. I live in a state that has all vote by mail elections. There are no lines. There is no shortage of working voting machines. There is no travel to a crowded poling place. There's no one to turn me away because my ID might be expired. There's even no stamp required as the envelope is postage prepaid. Voting couldn't be easier. Just fill in the bubbles, sign the envelope and put the thing in the mail. Vote by mail needs to go nation wide. Oh my, we can't have that say the banana republicans. Then we might actually have democracy! Voter turnout in my state was 70.79% That's not 90%, but it was better than past elections. Hi Oscar - that's good. From what I learned many years ago, democracy (small 'd') and/or a republic (small 'r') will be successful when it has an educated population which can and does vote. I have a question - how well educated are the 'voting classes' about what will happen if "Candidate A" gets in office as opposed to "Candidate B"? Do they know the policies which will be supported, or do they just know the Republican propaganda and the Democrat propaganda they see on the news-channels and media "name-calling sessions"? Here (in Scotland) it's not too good - but also not too bad. Last time we had an election, there was a lot of 'noise' in the news-media - statistics mis-quoted or selectively quoted to make a point, a bit of ridiculing of 'enemy' politicians etc - but the party leaflets we received through the door were quite good. Most gave policies and plans, projected income for the area based on these plans etc. At the previous election, only one party promoted "Vote for us because the other parties are worse!" - and they lost many of their seats on the Scottish Parliament and the UK Parliament Scottish members. The last time, they reverted to saying what they would do if they came into power - and they gained a few seats back. However, I don't really know how many people read the "straight, non-propaganda" data and how many people just ignore that and listen to the hype on the TV. I find it impossible to comprehend a place where people feel there are obstacles to voting. You constantly hear these stories about how people, particularly African-Americans, feel they 'can't' vote. I find that so impossible and don't see that there can be any fundamental reason for it or mechanism to do it. I am not denying it - I know too little about it and and believe the experts - but I still find it impossible to comprehend. You register, you vote. It is your responsibility to do both, and the responsibility of the electoral system to make that as simple as possible. Anyway - at least people are voting. But you can see why people, even if they can, are put off - so many of the candidates seem to identify themselves by who they hate and who they can smear. I mean, you wouldn't want them as friends, so why the hell should you vote for them to represent you! It doesn't have to be about hate and negativity. I think some of the new politicians are starting to get that, but maybe once they get in the system they are overruled by their party apparatchiks. Voting can be a positive experience, not a war of desperation. In advance of Saturday’s municipal elections, the Reykjavík City Library has asked the chairpeople of all the political parties standing for election what their favorite books are, and why, RÚV reports. See all of the chairpeople’s recommendations here. Polling stations will be open from 09:00 – 22:00 on Election Day, Saturday, May 26, 2018. For more information about the election see egkys.is: English here; Polish here. Now, sure, they might be fibbing. But at least it is not trying to tell everyone how evil your opponents are! Iceland has had a few crises recently and lost a lot of respect for its politicians - but the response is for more people to stand. In the municipal elections, a much higher percentage of older people voted than younger people, but that is natural - when you are young, you think everything just runs itself! The US has so much going for it, in terms of a commitment to deep democracy and a spirit of Revolution - it is just so depressing to see it turn into the most negative of slinging matches even the Politburo would be ashamed of. Maybe this new lot will have a bit more gumption, and when their advisers tell them the way to win elections in future is to destroy your opponent, they will tell them to go shove it. But then they will probably lose. Sad. I would normally add a corollary at this point that I am not insulting the country, just some of the candidates - but in this case I have to admit I think I am. Outside of despotic regimes, people get the electoral representation they deserve, and too many electors seem to have embraced the negativity. Not all, of course. But enough, at least for now. Not so much an insult, Thar, more a constructive criticism. **Closing polling places in areas with high AA populations, meaning longer travel time (particularly if one does not have a car) to get to a polling place. One may not be able to afford the time to take a bus and then stand in a longer line, or--if there is no public transportation, as is often true in the US--one may not be able to afford a taxi or have the time to walk, especially if one has children. **Restricting polling hours. This will primarily affect low-wage earners, who have no ability to just take time off work and usually have little control over the hours they are scheduled. If you cannot get off work in time to make it to the polling place, you cannot vote. **Disallowing early voting or restricting it to very few locations, very few days, and very short hours. Early voting being one way many with inflexible jobs and who are financially unable to take time off, or cannot risk losing a job by "missing work" have dealt with these problems. In some locations, early voting was changed from weeks of days with eight hours on each day to less than one week with only three to four hours in a day. The number of locations was also reduced. Combine those with the need to coordinate child care and pick up children therefrom, and one can make it extremely difficult, if not impossible for some. **Require specific forms of ID, and require that the name on the poll log exactly match the name on the other: no "Donald A Smith" on one and "Donald Anson Smith" on the other. No "Sarah Smith-Jones" and "Sarah Smith Jones" or "Sarah S. Jones" on the other. This is also used to disenfranchise elderly voters, who may no longer drive and may have difficulty getting out of the house to obtain an new ID. **For African-Americans, who are born at home at higher rates than many other groups, the documentation required to get a specific form of ID may be very difficult or impossible to come by, particularly if the birth occurred a number of decades ago. Once, they could get a license with, say, a baptismal record. Now that's not allowed and the law requires a hospital birth certificate (not available if the birth was at home) or a doctor-signed birth certificate (not available if there was no doctor in attendance). **Removing voters from the rolls if they've not voted in three elections and requiring them to come to one, central location (which may not even be in the voter's home town), with "proper ID" to re-register. And, of course, there's the old standby of having para-militarily armed police or sheriff's officers around the polls on voting days. Or, of having a poll worker simply lie, and tell a voter with a non-approved ID that the voter may not cast a provisional ballot (one that's held until the ID's are matched satisfactorily and then is counted). African-Americans are not the only group so targeted. Poor people in general tend to be targeted this way as are some other ethnic groups. So are populations of elderly voters, who are also at risk of not having appropriate ID. These measures are also particularly a problem for the frail elderly, who may have trouble leaving the house to obtain new ID. The elderly are more likely to have been born at a time and place without "proper documentation", the records even of hospital births may not still be extant, they may have difficulty with transportation to the polls or be physically unable to stand in long lines. College students are targeted by laws which do not allow them to vote where they are going to school, requiring them to make arrangements to vote absentee in a remote home town. Thar wrote: ...responsibility of the electoral system to make that as simple as possible. It appears that this is where the system falls down. In fact it is known that some of the officials in certains states are even pulling fraudulent stunts trying to prevent veteran votes or mail-in votes from being counted. I didn't pay attention to details but how would boxes of mail-in votes be left uncounted until they were discovered? Nor do I know details of the fiasco in FL where the president is urging that the Republican candidates be declared winners when they are still counting and recounting the midterms right now. I used to think that the US was a democracy with elections similar to Canada's. My first inkling that that is not the case was when Al Gore was robbed of the presidency by FL. Imagine if he had been elected - probably no war to take down Saddam Hussein and its horrible consequences, and climate change mitigation would have started way back then. It blows my mind that any of the practices you mention are allowed. Especailly the intimidation. An election cannot be democraric with all those hindrances. Then there are the issues of money in elections and in the government officials after being elected that I've learned about on the forum. We tick a box on our income tax so that they send out a voter registration card which we take with us plus a piece of preferably photo ID. We used our driver's licence but a heath card has a photo too. The polling clerk takes a ruler and strokes your name off the list as you go behind a booth to fill in the ballot. Nobody is allowed near the polling station except the officials, with a pen we fill in a bullet beside the names we wish to elect on a heavy piece of paper, and this last municipal election the paper was threaded through a reading machine that was not connected online. They have the paper if a recount is needed. Easy peasy. In and out in 7-8 minutes. There are several staions set up in each district so it was only a 3-4 minute drive. We could have walked there. We have early voting dates too. In the last CDN federal election more young people voted but even when it is easy the turnout was still only 68%. Australia has a law that you must vote and their turnout is in the ninety % range. In the UK you fill in the form that is sent to the household. Send it back and your name is on the roll. You get a polling card before each election with a map showing the polling station, but you don't have to take it with you. Once you are on the register, you can request a postal vote and do it in advance, or request a proxy and have someone vote for you. 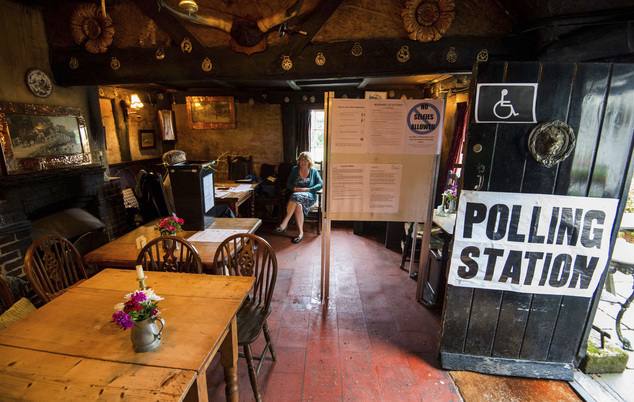 Or on the day, go to the polling station - usually the local primary school, or a church hall or community building - but in areas where that is too far, you get creative with pubs or even private houses. June Thomas, 73, and husband Graham, 76, have hosted general and local election voting at their home in Winwick, Northants, since 1990. Residents can cast their votes in a 4ft by 6ft booth under the stairs of the Victorian house, which was the village school until 1947. It is one of the few remaining private residences used as a polling station and over 70 villagers will descend on the property today between 7am and 10pm. 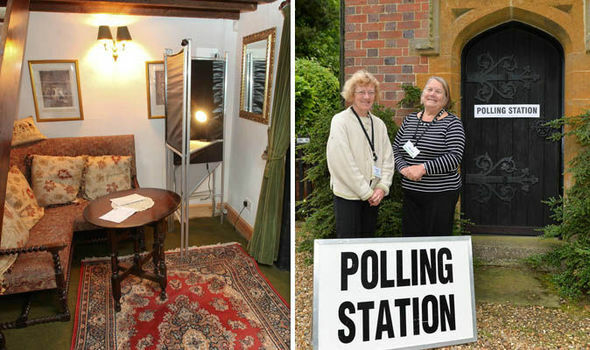 Gran-of-three June said: "It probably is the smallest polling station because it is just our hallway under our stairs where we keep the broom. "It sounds quite parochial, but it is run exactly the same way as any other polling station would be run. "We're advised to wear plain clothing - preferably navy or black with no colours pertaining to particular parties. It's all very formal, so don't expect a cup of tea. We abide by the rules in the same way as we would if we hosting 7,000 people. "Everyone is welcome. Sometimes the police come in to see how everything is going - but we've had no riots so far. "We've never had any complaints so long may that continue." As the polling clerk Mrs Thomas will have a presiding officer and the pair will check people off the voters' list from the comfort of her corner sofa. She has already sent off her postal vote but husband Mr Thomas, a retired farmer, will vote in his own hallway. The couple decided to open up their home as a polling station after their local manor house, where the vote was traditionally held, was converted into a private residence. Mrs Thomas, who has three grown-up children, added: "Our house used to be the old school, so it was a central part of the community and this way, come general election time, it still very much is. "When the new owners of the old manor didn't want to host it anymore, I thought I would offer. It's a bit strange having all these people in your home, but it's a small village and we pretty much know everyone here. "So its not like we have loads of strangers descend on the house, I do like to make sure its nice and tidy though before everyone comes. "It's a long day - we have to sit there for 14 hours, but it's a nice thing to do for the local community. " It really is not that difficult to make it work. Now can you see how I am so confounded by the claim that people can't access polling stations? In the USA, which not only prides itself on its democracy but considers itself the democratic beacon of the world. I know distance in the US are not comparable - but use the post, drive a van around - anything - you can make it work if you want to. And where is everybody else who is complaining about this? What are they doing about it. Are they demanding polling stations in their hallways - are they offering their homes and their time? Are they changing the situation, or expecting someone else to do it? Sorry, that turned into a bit of a rant. But a rant-worthy subject, I think. There is no comprehensive photo ID system in the UK. Many people will have a passport, and if they passed their driving test within the last few years they will have a photocard driving licence, but if they are older there will be no photo on their old licence. If you don't change address, your licence doesn't need to change. That certainly never stopped anybody from voting. Anyway, that was a digression. Back to my point. There are strict rules as to the numbers of people outside polling stations and they are not allowed to campaign, only ask how you voted. And of course you don't have to answer. In my experience, nobody tells them, on the theory it is person and none of their business. There are never any police (that I have ever seen or heard about, in England at least - except at exceptions like Tower Hamlets). You go in and tell them your name. You don't need to show any ID - you get given a voting slip or slips, they cross your name off the list, you go in the booth, mark your paper, put it in the box. Polling stations are rarely more than a few minutes from where you live and open all day till ten at night. The counting starts immediately and is reported the next day. Party activists and community organisations can come round and offer you a lift to the polling station if you have trouble getting there, but they can't control who you vote for once you get there - and in my experience of activists in the UK, however passionate they are about their own party, they are fundamentally interested in getting people to vote - they would be horrified at the idea they would only help their own voters (even if their organisers may not be quite so clean-hearted, and concentrate their resources where they think it will bring them the most votes). This system was built on trust, and honour, and now that will have to change. To some cultures, the idea of democracy does make much sense if it gives your opponent the chance to win, and the vast number of postal voters registered at single addresses in certain London boroughs such as Tower Hamlets has revealed organised fraud by certain groups. The process of voter registration and election organisation there have been taken over by outside overseers because the local council was found to be totally corrupt all the way from top to bottom, with appointments by nepotism and for personal gain. An east London mayor has been removed from office and a poll declared void after he was found guilty of electoral fraud. An Election Commissioner concluded Tower Hamlets mayor Lutfur Rahman breached election rules and must vacate his post immediately. Four voters alleged he used "corrupt and illegal practices" in last year's election, which must now be re-run. Mr Rahman, who denied any wrong-doing, has been banned from standing again. At the special High Court hearing, Election Commissioner Richard Mawrey also ordered Mr Rahman to pay £250,000 in costs. One of Mr Rahman's aides, Alibor Choudhury, was also found guilty of corrupt and illegal practices. Tower Hamlets First, Mr Rahman's party, said the judgement was a "shock" and it was seeking further legal advice in relation to a judicial review. Mr Mawrey - who sat as a judge - said the mayor had "driven a coach and horses through election law and didn't care". There was also voter intimidation, both within the Asian community and at polling stations. That is sad, because the simple, relaxed polling system that relies on people telling the truth has been tainted by people who have no concept of the rights of others. For now it is only a local problem. Maybe with integration, electoral integrity will grow in second and third generations. Or maybe the stain will spread and the system will have to be completely overhauled with much more intrusive checks on voters. The Labour Party in Tower Hamlets has been described as a 'cesspit' even when Rahman was attempting to be selected as their candidate, so it is not that he is an isolated problem. This fraud is local and not endemic, but it does go deep and it is very sad for a country with a proud voting tradition. I don't think most British people know how lucky they are with their voting system (regardless of the representation, PR and all that - I mean the simple ability to walk into a polling station at the school at the end of your road, and never be asked for ID, because the assumption is that you are an honorable person, and are who you say you are). It makes me very sad and angry to see that debased. Some of the fraud was rather unsubtle - things like 22 postal votes registed to one flat, if I remember correctly. Clearly all fake. But the underlying problem - the idea that people do not have the right to independently cast a vote from their own conscience - that is something cultural and you can't contain that with anti-fraud controls. A scandal-hit London borough has had to implement some of the most intense anti-fraud measures in the country before the local elections. Tower Hamlets is the only council in the capital, and just one of three in the UK, fully using the Government’s anti-fraud postal vote pilot. It follows previous complaints that the postal ballot system has been used to “farm” votes. The Standard was shown the “intense scrutiny” each postal ballot must go through to ensure they are genuine. Just over 31,000 postal votes were sent out in Tower Hamlets, with a warning that they should only be filled out by the addressee. Behind a guarded door in the town hall, each form is scanned through a computer where 100 points on the signature are checked against their postal application, as well as date of birth. Discrepancies flagged are investigated by a team with “forensic science training”. A sample of voters are phoned to check they received their form, while others are questioned about whether they filled it in themselves. Council chief executive and returning officer William Tuckley added: “Every ballot is intensely scrutinised, but we err on the side of inclusion. You can’t put a price on democracy and we want people to feel we are running a fair election.” More than 1,000 homes with five or more people registered to vote have been checked by council officers. Anti-fraud police officers equipped with body cameras will be deployed at every polling station on election day. This month, the Standard revealed 39 new allegations in Tower Hamlets of corruption in the run-up to next month’s elections, including complaints of bribery, forgery and ballot tampering. Yesterday, the Standard reported that police are investigating allegations of postal vote fraud in Hammersmith and Fulham. It is understood a number of people reported suspicions that they had been tricked into applying for a postal vote. The council said there were no concerns over the validity of votes. Mr Tuckley became TRower Hamlets chief executive in 2015, shortly after independent mayor Lutfur Rahman was ousted by an election court for “corrupt and illegal” practices and banned from office for five years. This year, Labour mayor John Biggs is up against councillor Rabina Khan of the People’s Alliance, and councillor Ohid Ahmed, of Aspire, a party founded by Mr Rahman. Hope you don't consider this hijacking the post - it got longer than I planned. But I think the ideas about what can go wrong with ideas such as postal votes are useful to see, and I don't suppose most people outside East London know much about the internal politics of Tower Hamlets. Some of the more perturbing complaints that Mawrey assessed concerned what might be loosely termed dodgy methods or dirty tricks. Did they fall on the wrong side of the law? Mawrey did not find that there had been intimidation at polling stations, albeit “with considerable misgiving” in view of the evidence he’d heard. By contrast, he had little problem finding that Biggs had been falsely portrayed as racist. Other examples where he found in the petitioners’ favour taxed him more. Drawing on the PwC report, which had been published in November, he described Rahman’s approach to grant-giving as showing “total disregard of the established rules and procedures of his Council.” He found “attractive” the defence that Rahman’s actions might be, rather than bribery, a serious example of what is known in America as “pork barrel politics”, and observed in passing that the use of the term by Rahman’s counsel showed “great daring in the circumstances.” But it was not attractive enough to convince him. The question of undue spiritual influence was, he wrote, “the most troublesome part of the case” and his adjudication “bound to be controversial”. It was. He said the court was unable to treat Hafiz Moulana Shamsul Hoque, chair of Tower Hamlets Council of Mosques, as a reliable witness. He was clear that a letter signed by Hoque and 100 other Muslim clerics published in Bengali in a newspaper called the Weekly Desh demonstrated their “participation in Rahman’s campaign to persuade Muslim voters that it was their religious duty to vote for him” and that this crossed the line between what is and is not permissible. Hoque and Rahman, he was sure, had been working hand in glove. I didn't think voting could be so difficult in the US. Over here, if you are elderly, you can vote at home. They will come with the ballots and the box to you on the election day (which is always Sunday). And since everyone has a passport, no problems with identification. All of the examples that Thar gives are valid and entirely possible to enable in the US. But the US election industry is no longer set up to make voting accessible. Conservative states and counties within the US now have free reign to put up as many barriers as they can as long as they call it "security". Saying "all you have to do is..." is completely understandable from someone outside the US who has not lived it their entire life. All of the solutions to the problems are very easy fixes, but the most hideous problem is that the obstacles are there on purpose, not by accident or mistake. Progpen - "...the most hideous problem is that the obstacles are there on purpose, not by accident or mistake." Sadly, that's something that a lot of very disapointed people around the world have discovered, about so much of the "Checks and balances" said to be in place in order to protect people in America. I still don't think it is a sufficient explanation. 'The system' doesn't do this. 'States' don't do this'. People do this. Even if some committee makes these restrictive rules, there must still be electoral officials whose job is to ensure democratic process. How can they not say 'no, we cannot run this election until it is run right'? And the people who elect the people to those committees - why are they not kicking them out. The explanation seems to be it is the 'system' but that system is set up by the people in the first place. All the other people who vote in that state. And aren't Americans taught in their civics classes, (which I suspect tell them how great their system is, and that it is better than anywhere else in the world), what to do in cases of taxation without representation - have a revolution? The police and other ordinary citizens grow up being taught this, just as much as the dangerous liberals and the minorities. I am not joking. And I am not preaching violence, just concerted outraged people power. They should happen on a regular basis, whenever the system gets rotten. It's a bystander effect, a belief that someone else will sort things out. It's become a habit to give up responsibility to something else, to an elected official or a system. Because as one simple human you can't do anything in the face of something so large, traditional and old - or so we tend to believe. And for all those people to decide 'no, we cannot run this election until it is run right', they'll need to find a lot of courage to shake things up. Individuals are usually too afraid that their actions might destroy the comfort/power/position they have without the guarantee that other people will support them. They need to band together and create a system of their own that's large enough for other people to put their faith into and feel comfortable supporting. That's not to say individuals don't have power. It's just that it's scary to be an individual challenging the status quo. At least, in my opinion, that's how it usually works. I understand your confusion here, but those people who could say 'no' are the ones who are creating the obstacles. That one is simple. People are not involved. They don't have time. They are not interested. They feel that they have been shut out of the system and aren't welcome, and in many cases this is correct. These are not excuses, but they are reality. I refer back to my previous answer. Apathy, disinterest, and disenfranchisement. In the past 30 years, we have seen a plethora of situations, incidents, actions by a very small, specific group of people that in other times would have resulted in just what you are talking about. Revolution. But, like frogs in the pot of boiling water, we had been desensitized little by little to all of the horrendous activity being perpetrated against us until now we cannot even be angry about mass shootings because they are expected. You are not wrong to expect more from us. But you are unrealistic.